What Day Of The Week Is November 20? 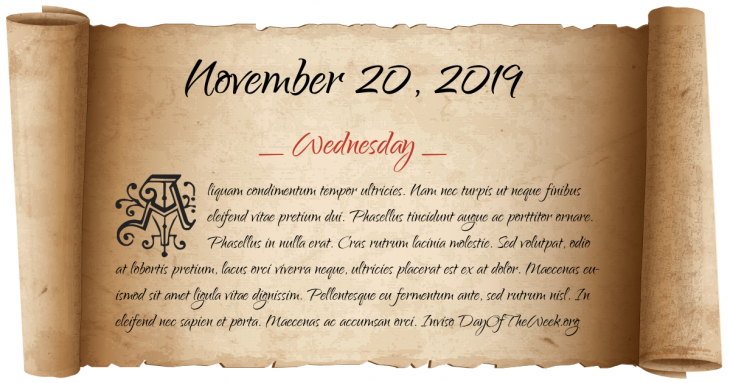 November 20, 2019 is the 324th day of the year 2019 in the Gregorian calendar. There are 41 days remaining until the end of the year. The day of the week is Wednesday. Zumbi, the last of the leaders of Quilombo dos Palmares in early Brazil, is executed. World War I: Battle of Cambrai begins – British forces make early progress in an attack on German positions but are later pushed back. World War II: Hungary becomes a signatory of the Tripartite Pact, officially joining the Axis Powers. Grand Mosque Seizure: About 200 Sunni Muslims revolt in Saudi Arabia at the site of the Kaaba in Mecca during the pilgrimage and take about 6000 hostages. The Saudi government receives help from French special forces to put down the uprising. Who were born on November 20?